In this lesson we’ll take a look at an Excel VBA code example. Again, we will assist ourselves by recording a macro and then adapting the code for our purpose. In this example, we want to track expenses and calculate the day totals as well as each category total. We will see how these calculations are achieved manually in ten steps and create a button to perform these in one click. 1. Open a new Excel workbook. 2. Go to the Tools menu; choose Macro, and then Record New Macro… Type Expenses in the Name field and press OK.
3. Go to cell B1 and type Food. 4. Go to cell C1 and type Gas. 5. Go to cell D1 and type Other. 6. Go to cell A2 and type 01/01/07. 7. When a cell is selected there is a small square at the bottom right side of the selection rectangle. As you place the mouse over the small square, the cursor will change from a wide white plus sign to a thin black plus sign. Press the left mouse button on thin black plus sign and slowly drag it down to cell A8. As you drag the plus sign downward the consecutive dates form 02/10/07 to 07/01/07 will appear to the right of the plus sign. 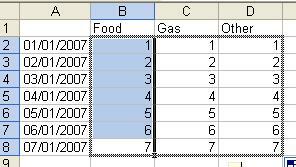 Excel will automatically fill in the corresponding cells with these value when you release the mouse button. 8. While 07/01/07 is showing, release the mouse button. 9. Press the Stop Recording button. If you closed the very small window with the Stop Recording button, go to Tools, Macro, Stop Recording. 10. 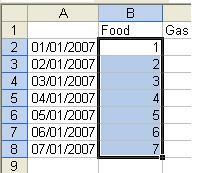 For the sake of simplicity, fill in the cells under Food with the values 1-7. 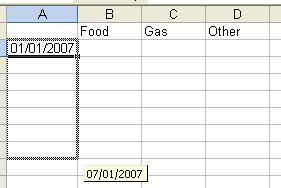 In this Excel VBA code example we want to see the sums of the expenses for both the days and the categories. 13. Turn on the recorder again. Tools > Macro> Record New Macro… Type Sums in the Name field and press OK.
15. Choose the E2 cell again and drag the small rectangle at the bottom-right down to cell E8. 17. Choose the B9 cell again and drag the small rectangle at the bottom-right down to cell E9. 18. Press the Stop Recording button or go to Tools, Macro, Stop Recording. Now it’s time to examine and customize our Excel VBA code example. We will customize it so that it will work not only when there are 7 day rows, but also with however many days/rows we add. word, called a Value, "Food." If we were manually typing this, we could have coded the same end result as, Range("B1").Value = "Food". So again, at this point you shouldn’t be overly concerned about or trying to memorize the code that we are creating with the recorder. that have specific meanings in VBA. assume that there are 7 rows with dates, or 7 days. It says "Select the last used cell." saw the 14th date, say 14/01/07. If we were to drag it by accident to 16/01/07 and then delete the 15th and the 16th, Excel would consider the last used cell to be in the row where the 16th was. We’ll overlook this in this example. In the first, we can see that LastRow will have to be adjusted and inserted in place of the 7, which represents the 7 rows of dates. We know that in our example, LastRow, which is 9, would need to be adjusted to 7. the difference of 2 is because the first row contains the headers Food, Gas, and Other, and the actual sum will be in the row after the 7 date rows. If there were 14 dates the sum would be in row 16, etc. LastRow now holds the value of 2 less than the value of what LastRow was. ActiveCell.FormulaR1C1 = "=SUM(R[-" & LastRow & "]C:R[-1]C)"
' we don’t need the last cell to be active/selected. Another Simple Excel VBA code example. Using the VBA Label to Create Flash Cards. In this Excel VBA code example create flash cards in Excel. An Excel VBA code example showing how to find the last populated. A simple Excel VBA code example showing how to make your code run when Excel opens. An Excel VBA code example showing how to delete a column. Learn how to move to add a Worksheet in this Excel VBA code example.